He was born in Bombay, Maharashtra. John Lockwood Kipling, illustrator, sketcher and father of famous writer Rudyard Kipling became mentor to young Bomanji. He led an expedition to the Ajanta caves, the trip proved a pioneering effort. In all he spent some 12 years copying the Ajanta murals. Most of the Ajanta project paintings were destroyed by major fire at South Kensington. Bomanji was educated at Elphinston High School, Bombay. 1864 At the age of 13 became the student of J.J. School, Bombay, and was trained under principal John Griffiths, John Lockwood Kipling and Higgins. 1879 The Calcutta Annual Exhb., Calcutta. 1883-84 The International Exhb., Calcutta. 1999 Gallery Chemould, Bombay. Till 1913 participated in most of the exhb. organised by Bombay Art Society, Bombay. Manifestations I, organised by Delhi Art Gallery, World Trade Center, Mumbai and Delhi Art Gallery, New Delhi. National Gallery of Modern Art, New Delhi. Prince of Wales Museum, Mumbai. Tata family collection. Indian Museum, South Kensington. 1879 First Indian to win a Prize at the Calcutta Annual Exhb. 1883,84 Award for his painting titled `Parsi Lady Sewing`, International Exhb., Calcutta. Received prize for `Parsi Tiger Slayer` at the Inaugural Bombay Art Society Exhb., in the category of best exhibit by a native artist. 1893 He was awarded the Vidercy`s prize, Simla. Madras Govt. also awarded him gold medal. He received cash prize, Bombay Art Society, Bombay. 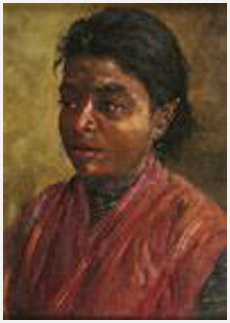 He was a popular portrait painter in the Bombay city. Painted in the academic western realistic style yet achieving his own individuality. He excelled at scenes of Parsi daily and religious life. 1890-94 Teacher & the first Indian Vice-Principal, J.J. School of Art, Bombay.